The need to mobilise private finance is at the heart of international discussions on how to finance the Sustainable Development Goals (SDGs) and move the needle from ‘billions’ of dollars in development aid to ‘trillions’ of dollars in investment. Expectations that blended finance can bridge the SDG financing gap are unrealistic: ‘billions-to-billions’ is more plausible than ‘billions to trillions’. 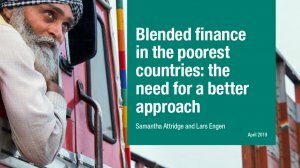 The big push on blended finance risks undermining the poverty eradication agenda in the poorest countries. Policy-makers need a better understanding of the poverty and development impact of blended finance, as well as its true costs, to ensure value for money and effective policy-making and allocation of aid. Multilateral development banks and development finance institutions need to collectively adopt a more distinct and tailored approach to blended finance in low-income countries.